Carbonara Sauce is possibly one of the most distorted and ‘abused’ sauces worldwide. I admit to being a pedant and quite militant with it when it comes to Italian food, but why mess with something so simple and delicious? By all means, make pasta with a sauce that includes cream, mushrooms…whatever you want to stick in it. Go for it! Just please don’t call it ‘carbonara’! Authentic Carbonara Sauce only contains a few very simple ingredients: eggs, pecorino cheese, black pepper, guanciale (it can be difficult to get hold of in the UK – I order it online – so you CAN substitute pancetta, but for the best – and most authentic – taste, try to get hold of guanciale), olive oil. Place a large pan / stockpot approx. 3/4 full of water onto the hob and turn the heat on high. While the pasta water comes to the boil, separate the eggs and place the egg yolks in a large serving bowl. 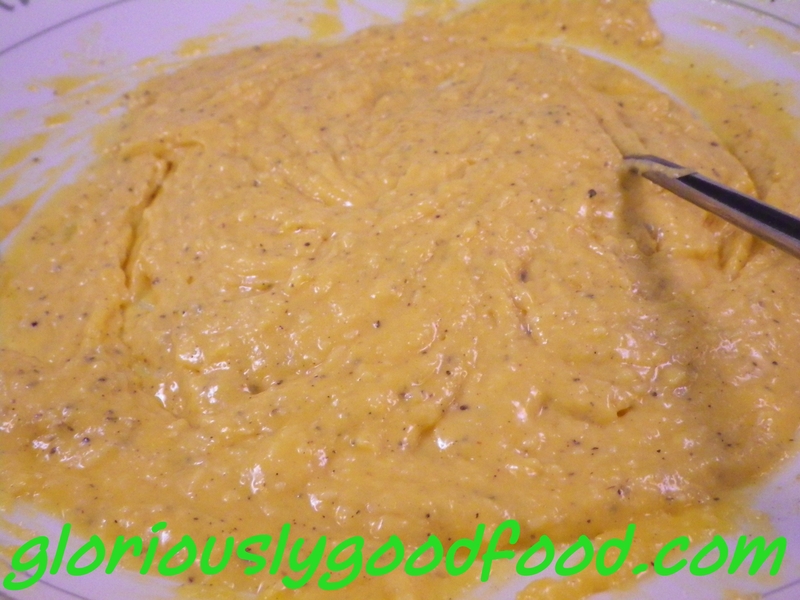 Add the grated pecorino cheese and freshly-ground black pepper to the egg yolks and stir in with a fork. Aim for a thick consistency. In a frying pan, heat the olive oil and add the diced guanciale, fry until the guanciale fat goes quite transparent and a little bit crispy. Once the water comes to the boil, add a few drops of olive oil and a small handful of coarse sea salt. Add the spaghetti when the water is boiling vigorously and push it down with a wooden spoon within a few seconds – as soon as it’s soft enough to ‘bend’ and stir so that all the pasta is in the water and doesn’t stick together. Cook the pasta for the indicated time on the pack, but taste it a minute or two before the indicated time to ensure you don’t over-cook it. It needs to retain a little bit of ‘bite’ – the ‘al dente’ consistency. Once the spaghetti are cooked, drain them and immediately drop them into the big serving bowl containing the egg yolks, pecorino cheese and black pepper, mixing them with a serving spoon and fork to ensure the pasta is evenly coated in the egg, pecorino & pepper mixture and no ‘clumps’ form. Pour on the olive oil and guanciale immediately and mix in. Serve & enjoy! 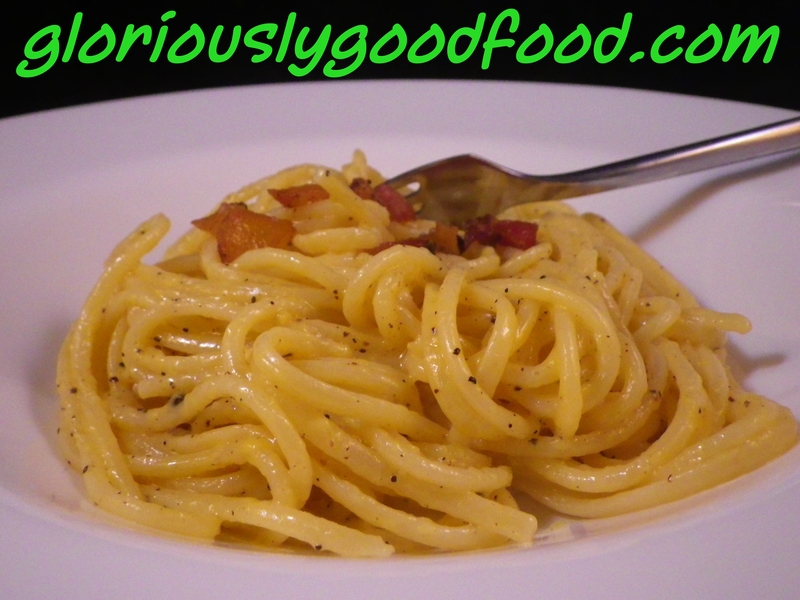 Spaghetti alla Carbonara – Gloriously Simple, Gloriously Good!